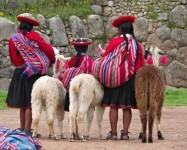 Alpacas were a cherished treasure of the ancient Inca civilization. Alpacas have been domesticated for some 5,000 years! 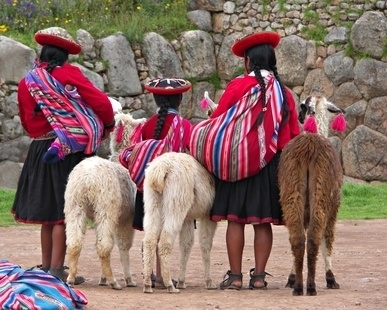 Alpacas produce a fine cashmere-like fleece, once reserved for Inca royalty. Alpaca numbers worldwide are small with perhaps 2.5 million in Peru, .5 million in Bolivia, and a mere 50,000 in all of Chile and Argentina.Alpacas were first imported into the United states in 1984. They quickly spread to Canada. Imports into the U.S. from South America are required to be quarantined for 90 days at a facility in Florida that can only handle 300 camelids at one time, making each import risky and expensive. Compared to the millions of sheep, cattle and horses found in the U.S. and Canada, the alpaca is a rare and precious resource. 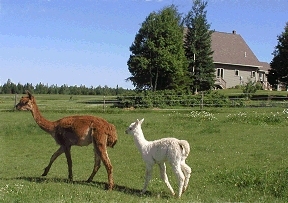 In North America there are around 10,000 alpacas as compared to 100,000 llamas. Alpaca fiber has a cellular structure similar to hair. It is much more resilient and much stronger than merino sheep wool. Prized for its unique silky feel and superb handle, it is highly sought after by the textile makers of Britain, Europe, and Japan. There are 22 natural colors of alpaca, and the annual fiber yield is about five pounds from a single female, and more than eight pounds from the larger male. There are two types or breeds of alpaca: the Suri, which has a lustrous fine fiber with no crimp, and the Huacaya, whose fleece has a crimp or wavy quality that enhances its use in spinning. The world population of alpaca is approximately 90% Huacaya and 10% Suri. North Woods Farm produce Huacaya alpaca.